To contact Ben Mitchell about this project, email him at bennett.d.mitchell@gmail.com. Spokane artist Ric Gendron knew it would be a “once in a lifetime” exhibit, the kind most painters can only dream about. It was a major retrospective of Gendron’s art, scheduled for February 2012 at the Northwest Museum of Arts and Culture. It would be accompanied by a full-color coffee table book. Both would be funded by a $30,000 grant from the Paul G. Allen Family Foundation. “Artists go through their whole careers without having this chance,” Gendron said. Then, one day last June, Gendron was walking through the Northern Quest Casino and Resort. His cell phone rang. The MAC, in the midst of a severe budget crisis, had just laid off senior curator of art Ben Mitchell. And because Mitchell was the man behind the Gendron show, the MAC canceled the exhibit, too. And the $30,000 from Paul Allen? The MAC gave it back. Gendron was devastated. According to his friends, you could see it in his face. Mitchell was stunned as well. Not only was he unemployed, but he was shocked that the exhibit was axed as well. He considered it “fundamentally disrespectful” of Gendron and his life’s work. Then one day, Maurice, Mitchell and Sue Bradley, who represents Gendron’s work at the Tinman Gallery, got together for coffee. And over the next few months, that is exactly what they did. Today, the Ric Gendron Art Project is alive and well. A 45-painting retrospective, “Ric Gendron: A Good Journey” will open in October 2012 at the Missoula Art Museum. Then the exhibit will travel to museums around the Northwest, and, if all goes according to plan, it will finally open in Spokane in 2014, although probably not at the MAC. I’ll explain how this merry band of art supporters pulled off this inspirational feat. But first let me tell you a little about the two protagonists of this story, Gendron and Mitchell. 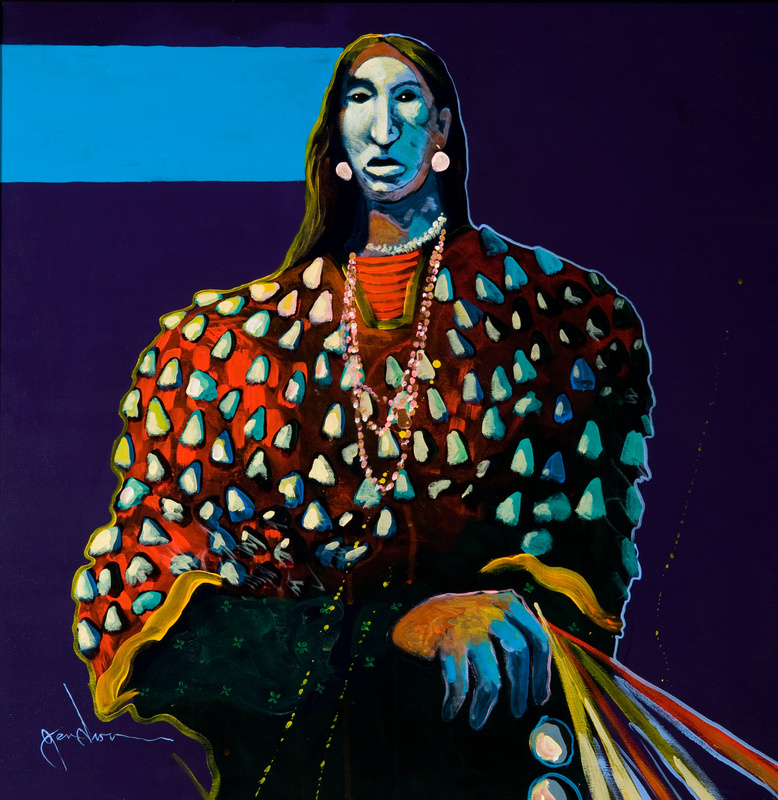 Ric Gendron, a member of the Colville and Umatilla tribes, is one of Spokane’s most distinctive artists, known for his bold and colorful canvases tinged with Native American themes, as well as his psychedelic-colored portraits of musicians. Have you ever seen those 30-foot-tall outdoor portraits of John Lennon and three other musicians at the Hotel Ruby at First Avenue and Lincoln Street? Those are Gendron’s. He has won big national prizes (two last year at the Santa Fe Indian Market), but like almost every artist, he still struggles. He paints to scratch out a living, and he paints because that’s who he is. Gendron is also an artist of massive power. Many of his paintings are deep, dark symbolic works addressing issues of modern life and Native American culture, tradition and oppression. Mitchell believes, with plenty of justification, that Gendron is one of Spokane’s most important artistic forces, right up there with Harold Balazs, Ruben Trejo and Timothy C. Ely – all three of whom were also given huge career-capping exhibitions by Ben Mitchell at the MAC. Mitchell himself was a different kind of cultural force during his five-year tenure at the MAC. He sometimes rubbed people the wrong way. He probably was not the world’s best team player. Yet he was tenaciously dedicated to one wholly admirable goal: giving longtime Inland Northwest artists the respect and scholarly attention they deserved. So when he lost his job and his exhibit, he didn’t just sit around and mope. Mitchell, Maurice and Bradley put their heads together to create the Ric Gendron Art Project. Mitchell then went out and made a pitch to Spokane arts patrons and foundations with this simple message: Do the right thing for Ric. The Community Building Foundation in Spokane, the Sahlin Foundation and the Hamilton Studios all stepped up, along with Maurice, Bradley and a number of other art patrons. They now have enough money to mount the exhibit, put it on the road and film an accompanying video. A contract has been signed with the Missoula Art Museum, which will premiere the exhibit a year from now. Arrangements are pending with museums in Boise, Pendleton, Ore., Salem, La Conner, Wash., and yes, Spokane. Mitchell is still not quite satisfied. He needs another $26,000 to produce the Ric Gendron book, to be published as a joint venture by the Missoula Art Museum and the University of Washington Press. All of this pulled Gendron right out of his funk. There were people, he realized, “who believed in all of my work.” His friend Maurice says he is doing his best work ever. Mitchell doesn’t try to hide the fact that this is all excellent for him, too, as the curator and author. In fact, the entire experience – except for perhaps that “layoff” part – has lifted his spirits right along with Gendron’s. He called it “enormously gratifying” to see so many people pitching in. Gendron, meanwhile, is acutely aware that he owes one man in particular a huge debt of gratitude.